Millionaire and heir of Stark Enterprise—weapons manufacturer with army contracts—Tony Stark is taken hostage in Afghanistan after the Humvee convoy in which he is traveling takes heavy enemy fire. Tony is imprisoned in a cave and given little time but all resources to reproduce his latest masterpiece: the Jericho missile…Only Tony has other plans. He builds an iron suit propelled by the very battery that is saving his heart from being shredded by the remaining shrapnel in his chest. 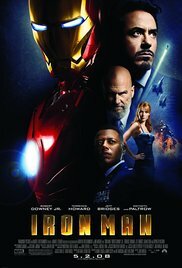 Directed and produced in part by Jon Favreau, the original Iron Man is the crème-de-la-crème of Marvel's universe. With a witty and stylish screenplay that makes science super cool, and top of the art special effects, there is no other alternative than to shine. But if those elements aren't attractive enough, the ensemble cast is just the superglue that holds this marvel together. Cool as well are Gwyneth Paltrow as the polished and very capable Pepper Potts, Tony's personal assistant, who happens to be his everything including his crush as well; Terrence Howard in both a playful yet serious role as Colonel Rhodey, gives a positive spin from government perspective to Tony's escapades; and Jeff Bridges as Obediah, is Tony's mentor and manages the day to day operations of Stark Enterprise. Also in the first reference to a branch up franchise (Avengers) is the appearance of Clark Gregg, as Agent Coulson of S.H.I.E.L.D. Finally, you're reviewing a movie I've seen! I thought Iron Man was great fun and Downey was perfect in the role. I admit I haven't seen any sequels, but this one was definitely a winner! I'm glad you saw it, Dorothy. I have seen it several times and always have a blast. I agree that Downey Jr. was perfect in that role. You should watch Iron Man 2; it was everything a sequel should be. Well I am a fan of Robert Downey Jr, thanks to the Sherlock Holmes films. And your review makes this on sound quite good. It is very good Judy. I know you are not a fan of superhero movies, but this one may actually change your mind. It did mine. Wow five stars. You're kind of film. Sounds fun. It is my kind of film. I loved it! I think these films are so much fun! I am looking forward to the new Captain America film which also stars Ironman and Spiderman in it! They are fun!I'm looking forward to that one as well. Nowadays I'm re-watching all the installments of Iron Man, Captain America, Avengers and Thor, in order to follow better the latest ones since their stories have started to intermingle somewhat. I want to catch things I missed before, hence the superhero movies reviews.